Onions, turned a beautiful amber color and cooked down to 25% of their original volume over the course of about four hours. Made using onions from Hyogo Prefecture and Hokkaido. 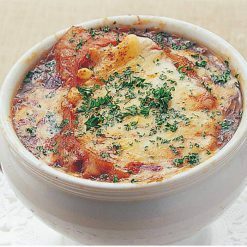 Can be used for onion soup, curry, stew, hamburger, and other dishes. Each package is 200g and arrives frozen. The onions are cut into 2mm wide pieces and thoroughly cooked for four hours in a flat pot, until they become amber in color. Afterwards, the onions have no harshness or bitterness to their taste, and have a refreshing sweetness. The oil the onions are cooked in is rice-bran oil. This oil has a lot of unsaturated fatty acid, which is good for you. We use 800g of onions to make 200g of sautéed onions. Sautéed onions can be used to add delicious umami flavors to dishes from all over the world, from Indian-style curries to Italian-style pizzas or Asian-style stir-fries. However, preparing and cooking onions can be a messy and time-consuming process. 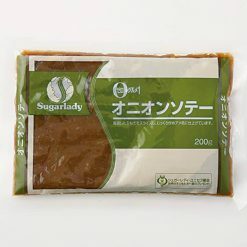 Sugarlady’s frozen sautéed onions allow you to quickly and easily utilize onions in your cooking without worrying about eye irritation or about getting that onion scent off of your hands and cutting boards! How to defrost: Defrost the onions in their bag, beneath running water. These sautéed onions can be used for onion soup, curry, stew, hamburger, and other dishes. How to make onion soup (4 servings): ① Add 600mL of water, 3 bags of chintan all-purpose seasoning, and 100g of the sautéed onions to a pot, and heat. ② When it boils, simmer it for about 2 minutes on low heat, then tweak the flavor to taste with salt and pepper. This product contains onions (Hyogo Prefecture, Hokkaido), rice-bran oil..